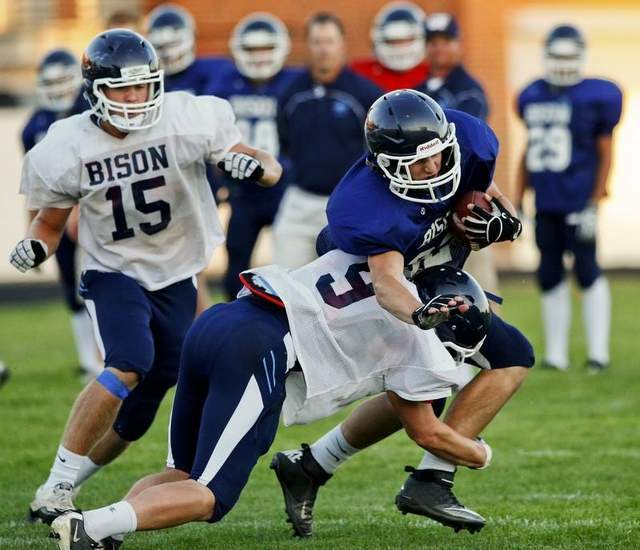 The beginning of the high school football season doesn’t do the Bison of Great Falls High any favors. They play host to last year’s state runner-up and historic powerhouse Billings West tonight at 7:30 at Memorial Stadium. Senior quarterback Kolby Sukut will manage the Bison offense this year and look to recognize the Golden Bears’ pass-rush. The 6-3, 205-pound signal-caller will look to spread the ball around to senior wide receivers Steven Paul, Dylan Tatarka and Sean Egan. Sukut will also look to hand the ball to utility player Colter Posey. Krahe says the Bison will have their hands full with West’s defensive pressure in the secondary as well. The Golden Bears lost several key players from last year’s 10-2 team, including standout quarterback Brady Gustafson, who joined the Montana Grizzlies. West senior quarterback Ryan Gallogly (6-2, 180) will fill the void left by Gustafson. The linebackers will anchor the Bison, with seniors Keenan Watt, recent Montana State commit Trevan Timmer and Zach Puckett driving the defense. Krahe says teamwork is this year’s pillar of the Bison.